JOYCE AND JIM ALLEN are married in Montecito in 1952. It was post-World War II Los Angeles. Two recent college graduates, one returned from war service in the Navy, had known each other slightly growing up. One had grown up in Windsor Square, the other in Hancock Park. But they had been three years apart in age, and they really didn’t socialize. Both families — the Allens of Windsor Square and the Daytons of Hancock Park — have lived in Los Angeles for 100-plus years. James Pendleton Allen’s father founded T.V. Allen Co., the prominent Los Angeles jewelers and stationers, in 1912. Fine paper, printed items, school rings and sports medals were among the company’s products. Special printing jobs were featured during the 1932 Olympics, and T.V. Allen Co. for years made the Academy Award envelopes. Jim and his brother, Van, grew up on Norton Avenue, and Jim attended Van Ness Ave. Elementary School, John Burroughs and Los Angeles High School, from which he graduated in 1943. After graduating from L.A. High in 1943, Jim soon was at Stanford, but he left to join the Navy training program at Cal and eventually was stationed on a ship in Hawaii until the ship headed west after the war ended in the Pacific Theater. In China, Jim and his Navy shipmates helped oversee repatriation of prisoners. Jim spent six months there, visiting Shanghai, Peking (in those days not yet Beijing) and elsewhere in China before returning to the U.S. and Stanford, from which he graduated in early 1948, at which time he headed home to Los Angeles to begin full-time work at T.V. Allen Co.
A fine artist as well as a businessman, Jim served as the company’s art director. But, on the side, he has created hundreds of beautiful landscape paintings, primarily in oils, over the years. Joyce, in 1949, after four years of college at UCLA and in New York City, returned to Los Angeles, where she and her friend, Nancy Elkins Hinds, worked as board markers (pre-computers!) at E.F. Hutton in Beverly Hills. But Jim and Joyce still did not know one another well. It was soon after Joyce’s return to town that Henry and Gladys Bateman had a party for local young people, many of them returned from the war, at the Bateman’s Sixth and Muirfield home. Both Jim and Joyce were there, each with another date. And soon, by about 1950, each had a girlfriend or a boyfriend. But, because they and their girl- and boyfriends traveled in the same social circles, it was not surprising that the four young people drove together that year to the Los Angeles airport . . . to drop off Jim’s girlfriend, who was flying to New York and moving there, and Joyce’s boyfriend, who was doing just about the same. Jim and Joyce waved goodbye to their friends and to the plane, and they drove back to town from the airport. And they started to date one another. In the spring of 1952, with Carolina Winston Barrie and friends at Rancho Guajome near Oceanside, Jim and Joyce were sitting on a wall around the fishpond, and Jim proposed. 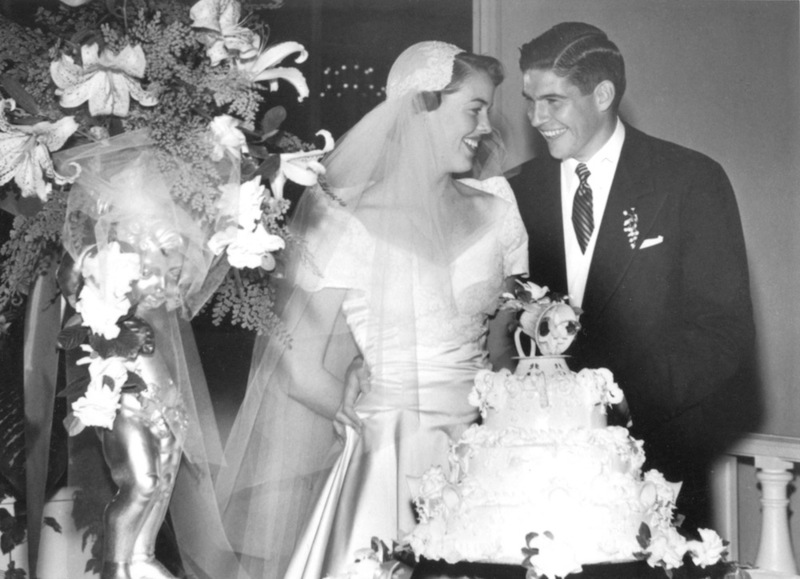 Later that summer, on August 23, 1952, they were married at a small wedding at All Saints-by-the-Sea Episcopal Church in Montecito followed by a reception at the Santa Barbara Biltmore. Their first Los Angeles abode was a unit in the apartment building on Olympic Boulevard at Muirfield Road, across the street from L.A. High “and right by the bus stop” says Jim. Next, Jim and Joyce moved north to a duplex on Irving Blvd., just north of First Street. In 1956, they moved to Joyce’s grandparents’ house in Hancock Park, and the Allens have resided there for 62 years. 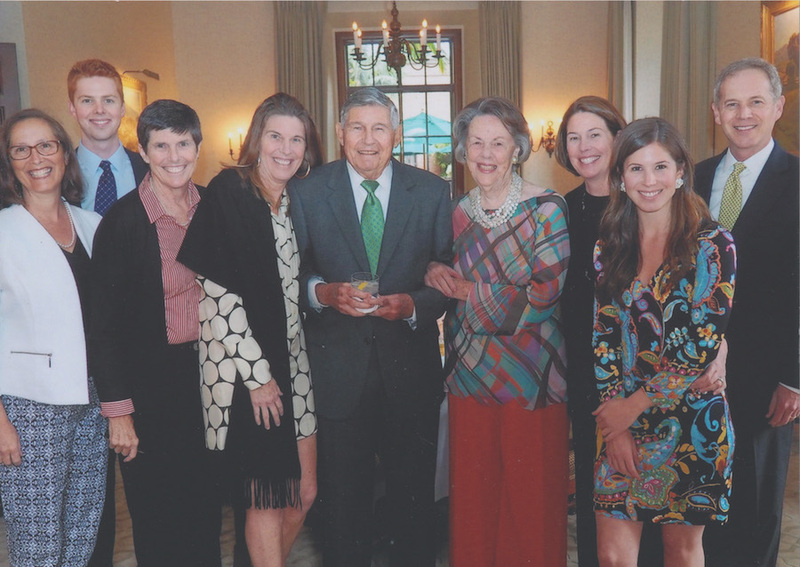 ALLEN FAMILY 63 years later, gathered with daughters, in-laws and grandchildren at Jim’s 90th birthday celebration in 2015. The Allens have three grown daughters, all of whom graduated from Marlborough. Lynn now lives in Hawaii; Diane is in Miami; and Kate divides her time between the State of Washington and Pasadena. The family’s involvement with T.V. Allen Co. ended in 1995. Jim now has more time to paint, and Jim and Joyce spend more time together and with children and grandchildren. And all because they drove to the airport for those fateful “goodbye” waves in 1950!